Now that I’ve etched the list in stone, so to speak, I’m thinking of all sorts of things that should be on there but aren’t. One thing that perhaps should have been on the list was “find a great banh mi sandwich in Paris.” I’ve had banh mi on the brain ever since arriving on these fair shores, probably because all the important of the equation were here. Vietnamese people? Check! Amazing, fresh, crusty baguettes? Check! A cultural appreciation for spreadable meats? Check! 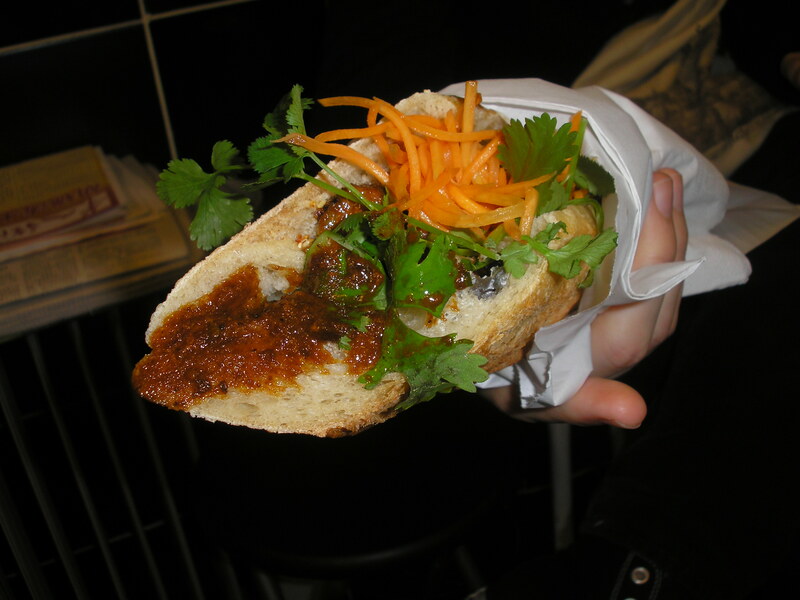 It seemed that banh mi would be a no-brainer in Paris. And there are, let’s say, many Vietnamese sandwiches in town. Following bread crumbs left by West Coast commentors on Mark Bittman’s New York Times blog entry that asked where a New Yorker might find a good banh mi, I headed to the 13th arrondissement and to Belleville (mumbling under my breath to no one in particular that Los Angelenos know a hell of a lot more about banh mi than New Yorkers ever will). Some sandwiches were quite passable, like the ones that you can get outside of the Tang Frères Asian supermarket, if somewhat mild for my taste. But I hadn’t found anything to get religious about, nothing to change your day over. Moreover, if I’m going to schlep all the way down to the 13th on a cold winter day, I’m going to eat pho or something amazing at Rouammit. And yet, like any diligent 21st century foodie, I kept googling. And what showed up more and more were reviews of a little place called, quite portentously, Banh Mi (7 rue Volta, Paris 75003, Métro Temple). Yesterday, which was rainy and filled with errands, seemed like the perfect day to drop in for lunch. The first piece of excellent news is that it is an easy walk from our apartment to 7 rue Volta, probably taking only about 10 minutes if you are really hungry and it’s raining really hard. The shop itself is tiny, with nowhere but tiny folding stools to sit. 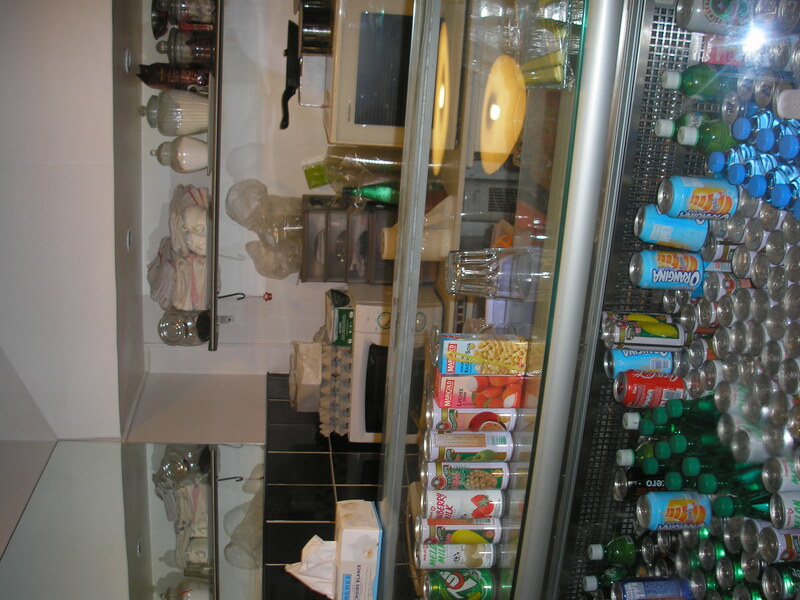 The vast majority of the space given over to the proprietor’s (Angela’s) kitchen. This is a banh mi shop, and so you have only one easy choice to make when you walk through the door: chicken, pork, or beef? There was a tempting pork pâté on the menu, but Angela informed us that she hadn’t made it today. And it quickly became clear that everything was made fresh and by hand daily, and that this was a woman who took the quality of her vegetables, bread, and meat very seriously. We ordered two pork sandwiches, which she disapproved of because she wanted us to try the different preparations of the meats. So I asked what she would recommend I order, and she said the chicken. One chicken and one pork, coming right up. I could watch this lady make sandwiches all day. First she starts with beautiful baguettes, which she warms to crusty-perfection over a conventional toaster. Then she adds the meat, which has been slow-cooked in a special sauce. The chicken is rotisserie tender and cooked with chilies and lemongrass, the pork is cooked in a caramelized tamarind sauce, and the beef is apparently sucré/salé, meaning sweet/salty (next time). Next she adds various chiles based on your desired level of heat. We requested très piquant, and we rewarded for that comparative adjective. Angela piled on perfectly crunchy slices of red bird tongue chiles, followed by crisp long spears of cucumber, piles of pickled carrots and daikon, and heaps of fresh cilantro. A few more special sauces followed (the only one I recognized was mayo on the chicken) and the hot sandwiches were handed over the counter. We noticed an intriguing Tsingtao stout (huh?) and decided to split one. We squatted on stools and got to work. Oh my lord these sandwiches are good. I mean, really, really great. They are everything you want a banh mi to be – spicy, sweet, crunchy, fatty, and umami. We shared the two, and I couldn’t tell you which I liked better. Paired with the surprisingly dimensional dark beer, it was a perfect lunch. Throughout our meal, Angela provided pleasant company, explaining that her tiny shop was only a year or so old and that business was steadily growing by word of mouth, especially from American ex-pats. We asked what time she usually closed and she said that she would close when she ran out of food, which was usually around 6 or 7 p.m. But she takes phoned-in orders, so you can call ahead and she will have your sandwiches ready for take out when you arrive. I suspect we now have a go-to solution for harried weekday evenings after teaching. 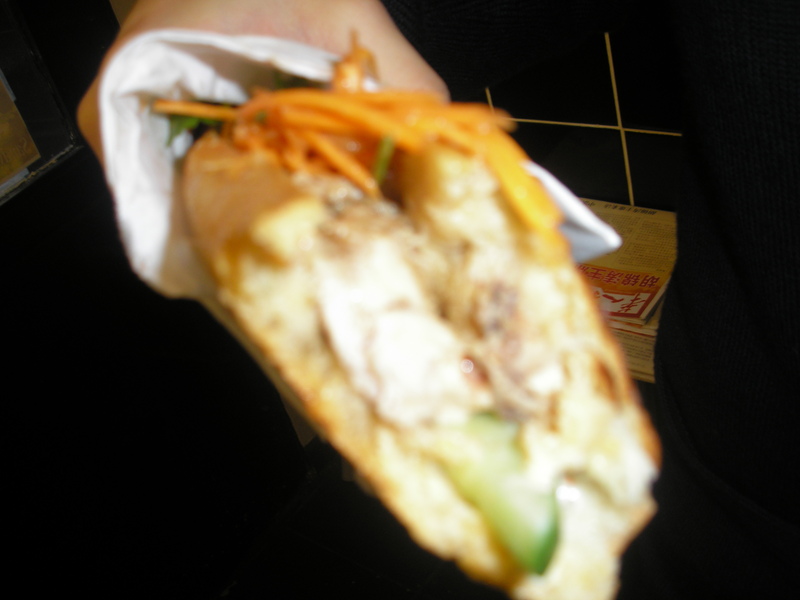 There is some chatter from the Chowhound folks (corroborated by a few comments made by the proprietor herself) that at 5 euro this is an expensive Vietnamese sandwich. Huh? Given that three blocks away from this is the aristocratic wonderland of rue de Bretagne, where you can easily spend 10 euros on a small beer or 4 euros on a shot of espresso, Banh Mi’s fresh, handmade, 5 euro sandwich seems like a bargain. And, as Angela emphasized repeatedly, quality is very important to her. She is buying the freshest vegetables and the best quality meats, which is often not the case at the bigger banh mi stands in Paris. Anyway, we’ll be back as soon as we can, and I hope you go to if you are in the neighborhood. This American wants to make sure that Banh Mi stays in business for as long as possible. Details: Open Monday through Saturday from 11:30 until she runs out of food. No seating, but an excellent place for a takeaway lunch or dinner. Those sandwiches were so good. And Angela is just about the nicest friendliest restauranteuse I’ve ever met. Let’s go back tomorrow, and the day after that. so delighted you are back… missed you. That is the kind of food I love! And I think five euros for such a treat is a huge bargain.